Deluxe Log Cabin in Tall Pines on 2.5 acres next to National Forest with large outdoors Jacuzzi, Fireplace, Game Room and 5 Bedrooms! The Forest Glen Lodge is a beautifully decorated cabin with 5 bedrooms on 3 levels. This home sleeps 16 with 5 queens, 4 twins, and a blow-up mattress. 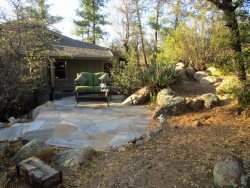 This upscale property is located in the tall pines just 9 miles or 20 minutes north/west of downtown Prescott. A large outdoor Jacuzzi sits on a patio overlooking the pines and stars. A nice game room on the lower level has a foosball table and a combo pool/air hockey table with a removable ping-pong top. This area opens out onto a deck with a patio set. To one side of the game room are two bedrooms, with 2 queen size beds, along with a bath. On the other side of the game room is a kids’ area with 4 twin beds and a TV. The main level has a large rock fireplace, SatTV and stereo. The living room, dining room and master bedroom with queen bed all open out to a large deck with patio sets, lounges, gas grill and wonderful views. There is a master bath and powder room. A large custom kitchen adjoins the dining area and laundry room. The upper level has two queen bedrooms and a full bath. The walls and shelves of the home are adorned with interesting and unique items that the Forest Glen Lodge owners have collected from all over the world. The whole lodge is served by DSL WiFi. There is a 2 car garage that can be used by guests. Central A/C makes this lovely forest cabin cool even during warm summer days. A washer/dryer and fully stocked kitchen make longer stays comfortable. Forest Glen Lodge is a custom home with wonderful views and many upgraded features. You only need to bring food and clothes as everything else is provided for your restful stay. Book this now for one of the nicest vacation stays in Prescott! Rates are based on 4 person occupancy. We try to make the larger properties reasonable for smaller parties. It's hard to put one price on a home that's fair for 2 persons or 14 persons. Extra guests are $15 per person per night plus tax. Thank you.